In the 1960s, it was proven that comics with gorillas on the cover sold far more than regular issues. Bruce Timm and his staff hope that gorillas still equal entertainment as the Justice League tackles gorilla mastermind Grodd this week. After an unsuccessful attempt to take over Gorilla City via mind control, Grodd has escaped to Central City. 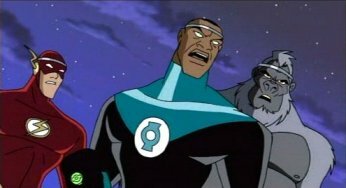 Flash and Green Lantern must work together to stop Grodd’s evil plan to destroy Gorilla City and any humans that get in his way. I can’t tell you how long I’ve waited for a comics writer to have his heroes realize how incredibly surrealistic the lives they lead are. Dwayne McDuffie delivers here with two lines that brought that point home. The storyline so far is very different from the other episodes we’ve seen. Rather than focusing on a handful of the JL team, this episode focuses only on Flash and Green Lantern (in keeping with the Brave and the Bold tradition). Their exchanges are at times amusing but very reminiscent of the relationship that the “reluctant to work with each other” Hawkgirl and Green Lantern have. Does Green Lantern get along with anyone? Why is he a member of the JL if he can’t get along? Halfway into the season, the writing staff has really started fleshing out the characters of the individual JL members. I would like to see more of why these heroes are the way they are. The only civilian life that we’ve seen of any of the heroes is Green Lantern was In Blackest Night, and he was going back to his roots that time. Why is he such a hard nosed hero now? Why is there a Hawkgirl on Earth? Is there a Hawkman? Not every episode needs to the standard super villain taking over the world formula. With Cartoon Network signing the Justice League team to a second season, hopefully we will get to explore all those possibilities and more.